How does the modern homesteader manage to balance everything that needs to be done? Amazing organization. 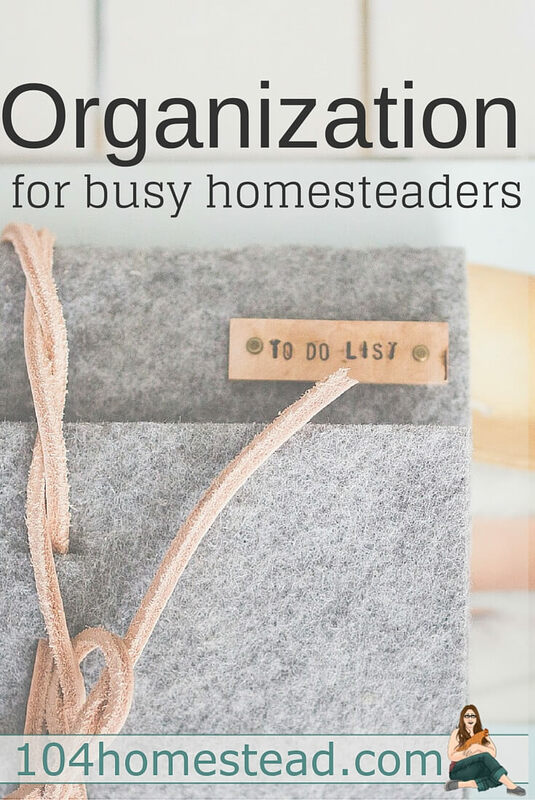 I’m going to share with you a few of my favorite organization tips that are perfect for the busy homesteader. From organizing the garden to dealing with the day-to-day stuff, I’ve got tips to help you get it all under control. Notes for next year so you don’t forget all those important things you wont otherwise remember. CLICK HERE to get your printable. Another big event with the changing of the seasons is the big clean. After a winter of heaters getting everything dusty and small children trapped indoors, cleaning the house can be a very daunting task. The most important thing is to take the big project and make it into a bunch of little ones. Most people tackle one room at a time. With a little person always eager to help, I tend to go a different route. While he’s watching his morning cartoons, I grab my DIY Window Cleaner and go from room to room washing all windows, mirrors and other glass items. Be sure to check out my post, Window Washing: The Trick to Ridiculously Clean Windows. When I am done I can just toss the cleaning cloth into the laundry bin. Then I continue on with wood cleaner, all-purpose cleaner, etc. When it comes to the laundry I do that in sets as well. I wash all the curtains and then all the bedding. That way you don’t have the first room sparkling clean and then it’s dirty by the time you get the last one done. There is no sense of accomplishment in that. When you have kids, it’s best to do the things they are unlikely to mess up first and the things you know will never last (freshly mopped floors) for last. If you are anything like me, you have been super annoyed (to put it mildly) when one of your little cherubs puts a dirty dish in with the clean dishes. Although you’re thrilled that they took the initiative to take care of something, the plate they put in is dripping syrup on everything in the lower rack and now it all has to be re-washed. Another irritant of mine is remembering to put the diapers in the wash, but completely forgetting to put them in the dryer until you have a naked toddler and nothing to put him in. My friend Bonnie at The Not-So-Modern Housewife shared these printable magnets with me that I think you are going to love. With these magnets you won’t be forgetting (as much) and everyone will know what’s clean and what’s dirty. CLICK HERE to see the whole set of printable magnets. I am so excited to introduce you to the Homestead Management Printables. This management system has 100+ pages that will help your homestead run smoothly. Track your garden yields, egg production, expenses, egg incubation, dairy production, pantry inventory, and more. The best part of this printable set is that you only need to print what you can use. Plus, you really only need to buy it once. The calendars change every year, but the other tracking sheets can be used year after year. Just print out new ones as needed. If you’re not sure how to use the Homestead Management Printables, Quinn shows you how she uses hers. 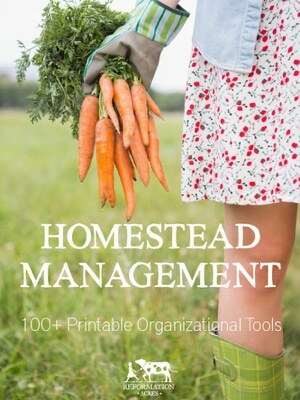 You can get your copy of the Homestead Management Printables here. 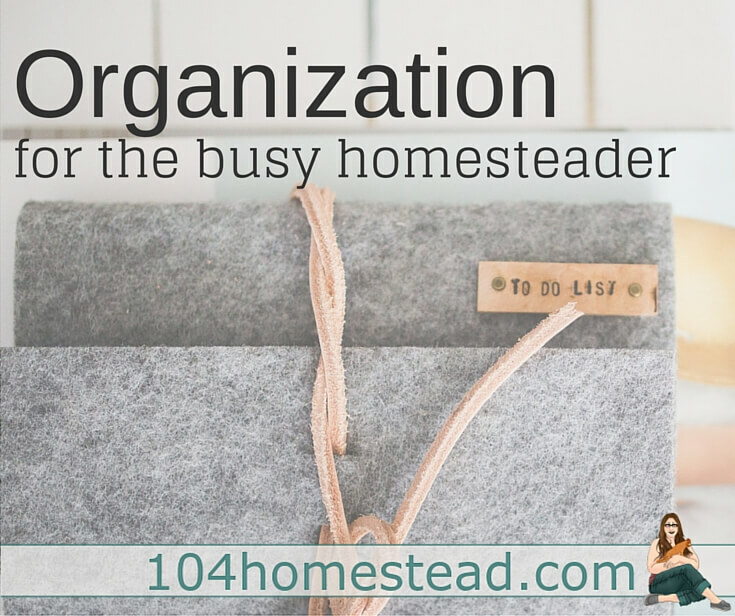 Hopefully these tips and tricks will help you keep your homestead organized. Do you have any tools for keeping things running smoothly? I need all the advice I can get on organization. It seems like everyday I am straightening things up. 2 young kids constantly moving things around makes it a bit more challenging of course. Oh yeah, if you have young kids, you need all the help you can get. I know how that is. I all but gave up during Christmas vacation.